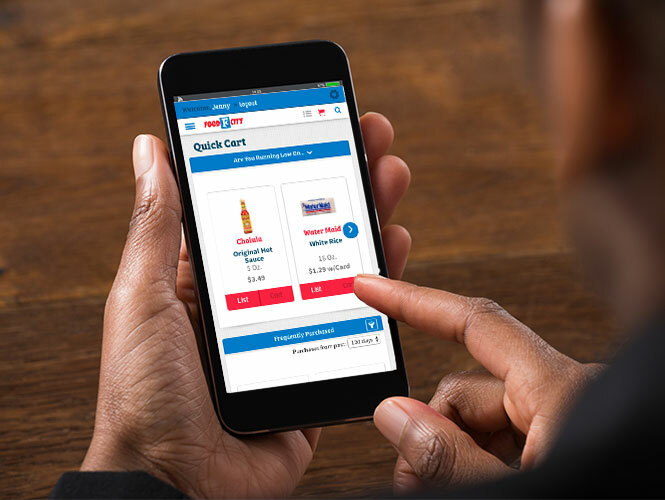 Quick Cart is an easy way to shop for your groceries online. Quick Cart combines your previous in-store and online ValuCard purchases to create a list of favorite and recommended items. Use Quick Cart to add items to your cart for quicker, more convenient shopping. You can add items directly from Quick Cart into your shopping list, for planning a future visit, or directly into your shopping cart to order the items right away. Select staples that you may be running low on or any frequently purchased item easily without the hassle of extensive searching. For even more convenience you can filter your Quick Cart items by product category, department, brands and more. Where Can I Find Quick Cart? Quick Cart is easily accessible from the Shop page. Quick Cart can also be accessed from any page at the top right of the website, if your home store is set to an active Go Cart location. 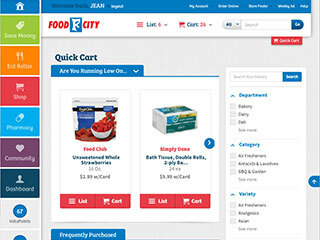 You must be logged into your FoodCity.com account to view Quick Cart items.